I grew up in Los Gatos, Ca. and graduated from Los Gatos High School as an art student. I began my formal art training at San Jose State University. After a few years of study I began to worry about making a living as an artist. I opted for a degree in geology as I was good at it and the colors and properties of minerals intrigued the artistic side of me. I graduated with a MS degree in geology and a teaching credential in art and science. I received local and national awards for mentoring and training. Working on the edge has been the biggest factor in my ability to grow as an artist. I believe It is important to live for today. Teaching experience: Teaching experience includes a State Single Subject Teaching Credentials in Art and Science and a Lifetime Community College Teaching Credential. I started teaching science in 1976 at State and Community College level, and art and science at the K-8 level. I teach flameworking, wire wrapping, and electroforming to adult learners across the country. $75 » Kit fee. Includes: Premade adjustable heavy copper bangle, fossil ammonite, dichroic glass cabochon, glass micro-beads, CZ’s, copper foil, copper wire, conductive paint, glue, miscellaneous polished rocks, sealed shells material, injection wax, tutorial containing detailed instructions, material resources, and photographs, and use of electroforming and polishing equipment and chemicals. Interested in the newest trend in copper jewelry? Come join me as we turn found objects into copper. Explore the endless possibilities of copper electroforming in an easy to understand format. 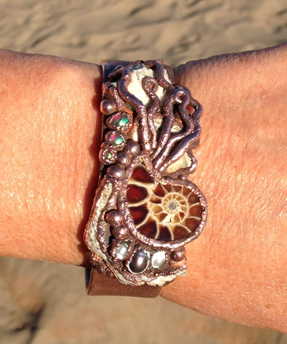 In this class we will be making a bracelet or cuff using heavy adjustable premade copper bangle combined with shells, fossils, metal, glass, rocks, pearls, and cubic zirconia gems. Techniques for framing, setting and protecting elements will be covered. Skills covered include basic electroforming, texturing and stone setting along with sealing, framing, and gluing techniques. Class will break twice during the day to provide time for bonding, and drying. Projects will need to process 18-24 hours for proper copper deposition. In addition to class resources, students are invited to bring small treasures to use in their creations (all organic materials will need to be sealed with lacquer and dry prior to use. Students will need to return to the classroom roughly 24 hours later to clean and pick up projects unless other arrangements have been made during class to ship projects. The class will use liver of sulphur (LOS) to darken final project.